Dashed hopes: Hardy in May had estimated the prospective resources at block D9 in the Krishna-Godavari basin at 10.8 trillion cu. ft of gas. 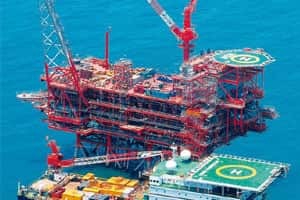 Mumbai/New Delhi: Shares of Mukesh Ambani-owned Reliance Industries Ltd (RIL) fell 4% to a six-week low after partner Hardy Oil and Gas Plc said that a well they drilled in a block off the east coast was dry. Hardy, a UK explorer focused on Asia, declined as much as 37% to 345.25 pence (Rs267) in London, the largest drop since the shares started trading in June 2005. The stock was at 330 pence at 8.30pm. “The exploratory well KG D-A1 will be plugged and abandoned," Hardy said in a statement on Friday. The Indian company said on Friday that it is committed to its programme of drilling three more wells in the block. “RIL remains committed to pursuing the exploration campaign within this block and will incorporate data and information from this well to upgrade the prospect inventory for drilling of three more wells," the company said in a statement on Friday. “Any rumour of RIL surrendering this block is completely baseless and unsubstantiated." RIL stock declined 4.04% to close at Rs2,047.30 on the Bombay Stock Exchange, its lowest closing price since 7 September, on a day the benchmark Sensex index gained 0.1%. “The market took it badly because they (the companies) played upon this particular oil find as promising," said Arun Kejriwal, director at Kejriwal Research and Investment Services, a stock advisory firm. “If another well in the same block is subsequently closed down, this block would become suspect and there would be an extra amount of caution by both partners in the block." Hardy in May had estimated the prospective resources at block D9 in the Krishna-Godavari basin at 10.8 trillion cu. ft of gas and 143 million barrels of oil, almost equal to the reserves in the KG D6 block, India’s largest field. The country’s oil regulator disputed the gas estimate, saying it was a premature announcement. V.K. Sibal, India’s director general of hydrocarbons, who had objected to these estimates, did not respond to repeated phone calls or to a message left on his mobile phone. A Hardy executive admitted that market expectations built on the exploration block were very high. However, the fall in stock prices was “excessive", the executive said on condition of anonymity. Hardy’s interest in India remains with exploratory blocks in Assam, the Cauvery basin and Saurashtra in Gujarat yielding discoveries. RIL struck natural gas in the KG D6 block in the Bay of Bengal in 2002—the biggest gas strike in the world that year—and began production of gas in April. Reuters and Bloomberg contributed to this story.